I have loved Teva sandals for a very long time. I have wide feet with high arches, and typically Teva's 7.5 feels like it was made for my foot. 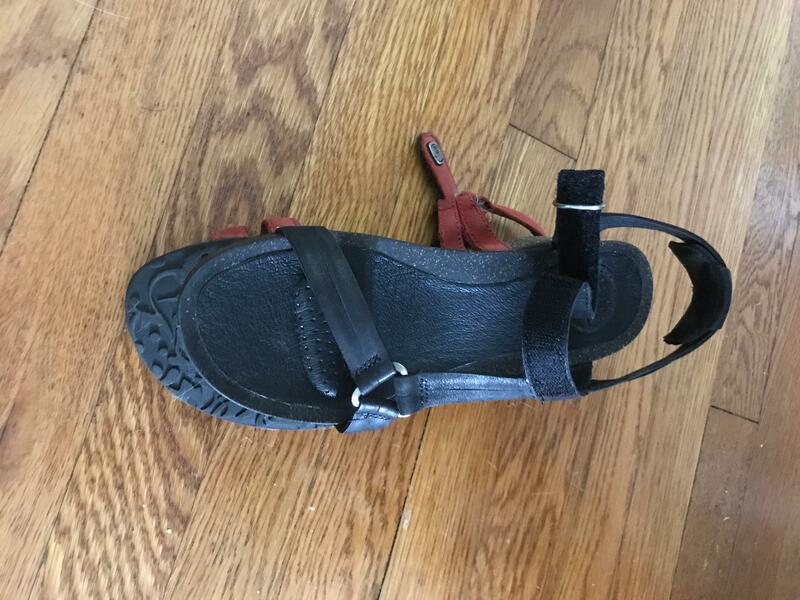 I purchased the Ysidro to replace a worn out pair of their Ventura Cork II sandals, and was met with utter disappointment. The Ysidro was almost a full inch shorter than the Ventura Cork II, and it was also significantly narrower. Additionally, the front strap is further forward on the sandal, and in the exact place where it could cause a bunion on my already wide feet. I don't even think going to a larger size would solve the problem. I'm hoping this is just a problem with the Ysidro, as I don't want to give up on Teva! These shoes were exactly what I was looking for: a comfortable, ruggedly fashionable sandal that can handle some serious walking/light hiking. I wore these everyday on a 2 week trip to Mexico, including for Chichen Itza and other ruins that have rugged stone paths and they were comfortable and durable. The decently thick sole prevented any pain from long days of walking. I did find that they took a few weeks to break in (the sole was uncomfortable for my heel at first due to it being a bit short) and the leather does stretch out a bit. I ordered both my regular size and a half size bigger, and kept the half size bigger since the other one was a bit short. I LOVE these sandals! I just bought two pairs to replace the two I bought in 2009 prior to a three month trip to Europe. I walked miles every single day in these and never had a problem. With the heel strap they feel very secure which is very important. So glad I was able to find them again. I really love these shoes. I wore them for three days around Disney World without one blister or getting tired feet / legs. We walked quite a bit, at 18,000 + steps per day as well. I did feel the difference between the footbed and the edge of the shoe as some of the others have mentioned. In fact, when I first tried them on, I thought it would be an issue. I gave the shoes my "treadmill test" though and knew that after a couple of miles I would be able to walk in them as much as necessary. I was so happy with these that I recently ordered the same shoes in a wedge. I do wish that they made this type shoe with a little more "pizazz"! It would be great to have the comfort and the sparkle! Ha! Give these a try! Even if you don't like them, you can send them back with no hassle! I bought these to wear at work - business casual but we can wear tennis shoes and open-toe shoes. I work in an office environment, but we are all serious about walking on our breaks. I walked almost 7k steps today around downtown today in these sandals and not a single comfort complaint. The material for the straps is very soft. I love the velcro vs a buckle bc I sit pretzel style in my office chair a lot. Buckles dig into my skin. I have a pair of sportier Teva sandals that I also love and have had for almost 2 years now. I like to walk a lot and flip flops just aren't functional for me. Lovely shoe. Superb arch support. Wanted to keep but found another Zappos sandal that was a wee bit cuter. And it runs a little larger. Super comfortable. need to go up a full size. I normally wear 8 or 8 -1/2. Never have bought a 9-1/2 shoe except this one. PS. I love these sandals! I wish you sold them in navy blue. I love these Teva Ysideo Universal sandals. They are very comfortable. I ordered black in a 9-1/2 because this is my size but when I ordered another pair in tan I order a 10 and they are perfect. It seemed that because of the higher heel my foot moved forwarded and I got a callus on my one toe because it hit the edge. But, the size 10 was perfect so I would order 1/2 size larger than shoe size. I just ordered another pair of black in the flatter heel this year also and I just love them. Most comfortable sandals I own!!! I am happy with these shoes. I ordered up a 1/2 size as was recommended and they fit well. I've only worn them around the house so far but I think they will be just fine for a comfortable, solid summer sandal. I usually wear a 7.5 in Teva. These were slightly short so I just reordered the 8. I have a very narrow foot, and even though these are still a bit wide on me, I can comfortably wear them. I love these for vacation walking, summer time when I'm in need of something for a T-shirt dress or equivelant. They are extremely versatile. I wear a 9 but based on reviews I got a 9.5, could have gone up to a 10. Very comfortable!! Loved the fit and style, right out of the box. Extremely comfortable. These fit my long, flat, narrow feet - size 9. It's difficult to find narrow sandals, these work for me. I always look for leather insoles when wearing footware without a sock, absorbant and no foot odor. The size and fit were fine. I could see walking a lot in these for a vacation. But the taupe color is really off. I was hoping for more of a flesh color, but these are more gray, almost a medium to dark gray. Never thought I would own a pair of Teva's. Never liked the look of them. Then I found the Ysidro style. I LOVE them. They look really nice on with any outfit and are so comfortable. Only one strap at the ankle to attach. Easy to toss on/off. Never had any issues with the leather, or breakage, or stretching... the cognac color is beaautiful. They feel like I'm wearing slippers. Did not have any "breaking in" stage. I'm guessing, because of the great quality, I will have these for many years. Very true to size. I bought these for an upcoming trip to Spain. They are very comfortable and I can wear them for a long period of time without my feet hurting. Super light-weight and the slight wedge makes them a little dressy. I also bought them in black. I typically wear a size 8/8.5 and ended up with a size 9. Overall, I highly recommend! After reading reviews when shopping for a very comfortable "walking sandal," I ordered the Teva Ysidro Universal in taupe. On the advice of reviewers, I ordered it a half size bigger than my usual 10 (yay! it comes in a 10 1/2!) and the fit is perfect. Immediately, I had an "ahhhh" moment. These are extremely comfortable right out of the box. The footbed is soft and smooth with just the right amount of support, the leather straps are soft and flexible, and there was absolutely no rubbing---I realize feet are all different, but for me, this is a decision-maker. 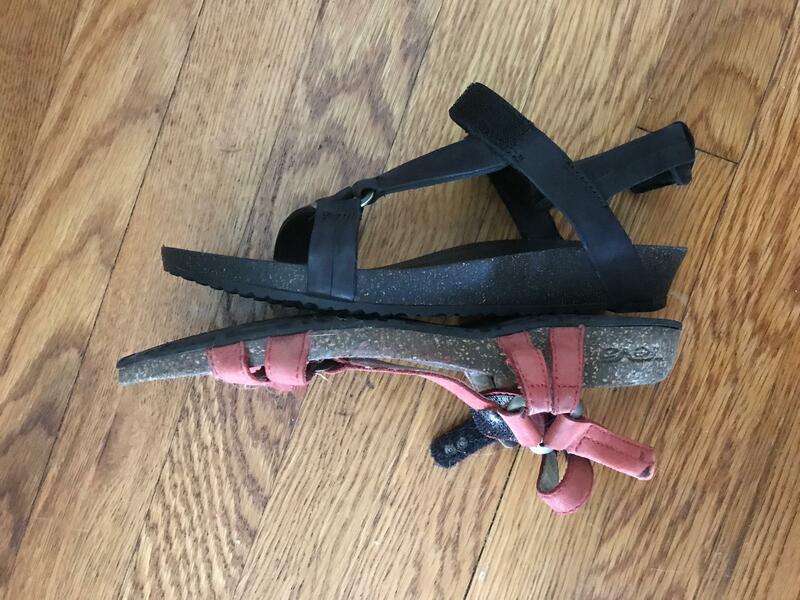 The acid test: We spent the weekend in Chicago and we walked 7 miles on Saturday and another 7 on Sunday, and in these sandals, my feet were comfortable all 14 miles traversed. Bear in mind, this was the first extensive wearing of these shoes. The velcro closure makes it possible to adjust the ankle strap for the bit of swelling at the end of the day. Bear in mind that the strap over the front of the foot is not adjustable, but for me, this was not an issue. On a more superficial note, the taupe color is terrific; it can be paired with brown, black, gray, is a good neutral. These will be my go-to travel sandals for many years to come. I ordinarily wear 9.5, so I was surprised that I had to upsize to the 10s for these. But I love these Tevas -- I have the more rugged Hurricanes, but these are great for when I need something sturdy but a little "fancier". I really like these! I actually just added them on to a shipment of a bunch of Teva hiking sandals to check them out just in case, and they ended up being the only Tevas from that shipment that worked for me. They're very good-looking, sleek, cushiony and the straps are not uncomfortable! I've been wearing these at work and really enjoy walking around in them. I'm not much of a sandal person, but it's been so warm lately that I needed a break from closed-toe flats. There are probably the best sandals I've ever owned! The shoe itself was really nice but I counted on Teva to follow the pattern they use for some of their other sandals that fit my wide feet. These were way too snug & the strap across the toes landed in an uncomfortable place, which might be the case even if they were wide enough for me. Love, love, love these sandals. However, I am a true 9 and I had to go up a full size. The difference between the 9 and a 9.5 was microscopic. The 10 fit great and I think these will look cute with shorts, capris or skirts - plus be comfortable enough to run around on the playground in. Win! OMG! I've never loved a pair of shoes more than these! They are the most comfortable pair of sandals I've ever had on my feet and they also manage to look cuter and more stylish than any Tevas or similar shoes I've owned before. I have owned three pairs of Tevas over time and my very first pair -- which look somewhat similar to these -- I purchased in 2005. They were great -- for outdoor trekking, by the pool, and casual wear around town -- and after 12 years, yes 12, of frequent wear, they literally just wore out few weeks ago. They were pretty basic -- function over style -- and I was looking for something very much the same to replace them with. Well, these Ysidro Universals are 10x better than even my beloved old Tevas. They check all the boxes for outdoor durability of any Teva, but they are also super cute and feminine. Fit was perfect, although I must say there is something about the design that makes them LOOK small and delicate and when I first took them out of the box, I said to myself, "Well, these are NOT size 10s..." Sure enough, they were size 10 -- they just have a great shape and style that makes them -- and my size 10 feet while wearing them! -- look smaller. Love, love, love them! Wow! Super comfy! Cushy-even padding under the ball of the foot, very supportive! I like the style & colors of the Capri Universal better, but for comfort this is Great!